In the 1920s there were 256 wineries in Sonoma County, with more than 22,000 acres (89 km) in production. During the Prohibition period, however, commercial winemaking declined. At the repeal of Prohibition in 1933, fewer than 50 wineries in Sonoma County survived. Even as late as the 1960s, only 12,000 acres (49 km) were vineyards. But wine consumption in American began to grow, and by 1999 Sonoma County had over 49,000 acres (198 km) of vineyards owned by more than 750 growers and 180 bonded wineries. Of the 250 wineries existing in 2007, over half are less than 20 years old. In 2004, growers harvested 165,783 tons (150,396 tonnes) of wine grapes worth US$310 million. In 2006 the Sonoma County grape harvest amounted to 216,000 tons, worth US$430 million.About 73% of Sonoma County’s agricultural production is growing wine grapes—60,302 acres (244 km) of vineyards,with over 1100 growers. The most common varieties planted are Chardonnay, Cabernet Sauvignon, and Pinot Noir, though the area is also known for its Merlot and Zinfandel. Sonoma County’s large number (13) of American Viticulture Area’s (AVA’s) reflect the wide variety of climate and soil conditions in the County, the large production in the County, and the prominence of Sonoma County in the wine market. The difference in climate and soil (terroir), means that cooler climate grapes grow well in certain regions and in others warm climate grapes are more suitable. The large production of the County means that each AVA is significant in its own right. The prominence of the California wine industry and Sonoma County in particular has established worldwide recognition of their wine regions. At the same time, many consumers have been confused by the many different AVA’s within Sonoma County. The growers voted in 2006 to form a Sonoma County Winegrape Commission, representing more than 1,800 growers. The Commission seeks to raise recognition for Sonoma County and encourages all wine from the County to bear the mark, “Sonoma County” on it. Green Valley of Russian River Valley AVA was formerly known as the Sonoma County Green Valley AVA. Located at the southwestern corner of the Russian River Valley AVA, its close proximity to the Pacific Ocean makes it one of the coolest appellations within Sonoma County. The climate in the Green Valley is even cooler than other parts of the Russian River Valley, and favors the cultivation of cool climate grape varietals. Seeking to connect the region with the more commercially successful Russian River Valley name, the appellation formally changed its name on April 23, 2007. The Los Carneros AVA spans the last, low hills of the Mayacamas Mountains dividing both Napa and Sonoma Valleys just north of San Pablo Bay. The larger portion of the AVA stretches into Sonoma County with grapes grown here also being allowed to use the Sonoma Valley AVA designation. The area’s close proximity to the Bay has made it an ideal location for Pinot Noir and Chardonnay production with producers from international Champagne houses such as Moët et Chandon (Domaine Chandon California), Taittinger (Domaine Carneros), and Cava producers planting vineyards or sourcing grapes from the area. Russian River Valley AVA lies adjacent to and west of the city of Santa Rosa and incorporates the southern reach of the Russian River, where the river bends westward and cuts through the Coast Range to the Pacific Ocean. The AVA is characterized by the regular intrusion of cooling fog from the coast. The fog flows through the Petaluma Wind Gap and the channel cut by the river. The fog generally arrives in the evening or early morning and retreats before noon in the day. 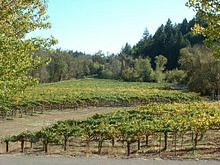 The appellation was granted AVA status in 1983 and accounts for about one-sixth of the total planted vineyard acreage in Sonoma County. In 2005 the AVA was expanded by 30,200 acres (122 km) to 126,600 by recognizing previously overlooked portions of the fog regions. Presently the Russian River AVA includes more than 15,000 acres (61 km) planted to wine grapes. At last count, 79 wineries were listed in the Russian River Valley Winegrowers website. The area is known for its success with cool climate varietals, notably Pinot Noir and Chardonnay. Sonoma Coast AVA contains more than 500,000 acres (2,000 km), mostly along the coastline of the Pacific Ocean. It extends from San Pablo Bay to the border with Mendocino County. The appellation is known for its cool climate and high rainfall relative to other parts of Sonoma County. Grapes growing along State Route 12.